If you need help with anything LunaLua related, ask it here! Please do check the wiki though since it's pretty comprehensive! I want to make a level based around the Starman, but I also want to try making some modifications to it's code (specifically, add a counter for after the music loops end and make use of the Colliders API), I think I understand what's going on for most of it, but some of the functions I have no clue what they do. For instance in starman.onTick there's something called NPC.getIntersecting. Is that for when mario picks up the star? Another thing I tried to figure out last night is how to make Mario's fireballs shoot correctly (have only two on-screen at a time, with no timer in-between firing, and a change to their x-speed). But when I first tried it I didn't know what function or API I could use to count the fireballs in Mario's current section. I tried NPC.get but it returned some hex values, and NPC.count, which I couldn't figure out. I don't know what arguments .count takes, if any. EDIT: Alright, I figured out the fireballs, but they persist while offscreen. I figure, I'll just find the screen coordinates and kill the npcs when they're about 4 blocks out, but I don't know how player.screen works. Its a RECT type and I went to look it up. Seems like its a function that returns the four boundary values? But whenever I try to use it I get "==> no such operator defined". Do I have to define a new RECT using player.screen? I'm clueless. 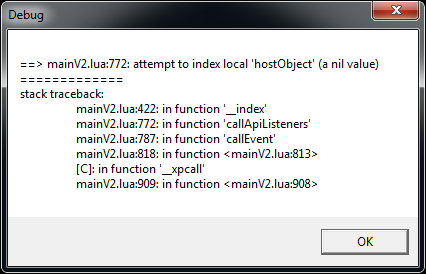 I went to mainV2.lua to check it out, but it looks as though its just defining the events for each API. I think it may be that I have to return some data from the API to the host level file but I don't know what needs to be returned. Oh my god, that was actually it. I'm so pissed at myself. Thank you, Hoeloe! Now I know what to do if that error shows up again. Last edited by KittyTristy on 24 Apr 2019, 14:21, edited 1 time in total. Does anyone have any levels using cinematX that are working with SMBX 2.0 that I could take a look at? CinematX is very old and broken and never quite worked properly. It's really not recommended to even try using it. It's been kept in for compatibility, but really you shouldn't be using it. There are some tools to do what it does in separate forms. The event scheduling is now part of eventu.lua, there's a simple "follower" script used by Bowser to replicate follower behaviour, pnpc.lua deals with keeping track of and modifying NPCs, and textblox.lua can deal with extra text printing (though that one is undergoing renovation at the moment). There's also imagic.lua, which can be used for drawing things like text boxes and speech bubbles should you want to. Last edited by KittyTristy on 24 Apr 2019, 14:22, edited 1 time in total. For whatever reason, I can't get midpoints to work at all. I tried looking it up on the wiki, and it tells me to use multipoints.lua, so I guess it's a Lunalua thing. At the same time, though, that raises more issues; Lunalua won't even open for me! It tells me to select a program... Can someone help me out here? Camwood777 wrote: For whatever reason, I can't get midpoints to work at all. I tried looking it up on the wiki, and it tells me to use multipoints.lua, so I guess it's a Lunalua thing. Oh midpoints! Yes, midpoints are very easy. The .lua files are basically just text documents. The notepad program that comes bundled with Windows can open them, but it's probably a better idea to get a free version of Notepad++. Notepad++ colour codes your lua code as you go along. You'll need to create a .lua file called lunadll.lua in your level folder. Notepad doesn't give you the option, so you have to select all files, then type in lunadll.lua. NotePad++ however, does give you the option of saving as a .lua. You need the first line to load the Multipoints API. The third and fourth lines are the midpoints. The numbers in the brackets are your coordinates: X, Y and Section Number. You get the X and Y coordinates from the debugger. Just switch the debugger on, and hover your mouse over where you want the midpoint goes. Write down the coordinates the debugger gives you. The section number is always one less than the actual one. So in the above example, I have a midpoint in Section 10 and Section 1. But of an odd question. Is there a way to draw something behind the player without putting it on their sprite sheet? Basically I'd like to imitate how the cape animates in SMW on a custom character, so it can animate independently and be drawn regardless of powerup state. Tyty wrote: ↑ But of an odd question. Is there a way to draw something behind the player without putting it on their sprite sheet? Basically I'd like to imitate how the cape animates in SMW on a custom character, so it can animate independently and be drawn regardless of powerup state. Certain functions in LunaLua allow you to supply a priority. Most priority levels are negative, and if you use a priority below the player (that's more negative than -25) when drawing with Lua, you can draw things behind the player. I want to make a level where things generate at random. There will be a total of 10 random screens generated horizontally before the flagpole and all pipes generated lead to a normal underground bonus section. When they come back up, the flagpole is there immediately. I've re-skinned Ludwig and would like to have him throw hammers instead of fireballs. I feel like a total dope, not knowing this when it seems basic.